'Bell dance' is gloriously coloured, with a rhythmic composition depicting a group of handbell ringers cavalcading across the pictorial surface, with one stooping with the weight of a large bell. Rupert Bunny presents these figures in a flat, decorative style, reminiscent of a Greek frieze or painted vase. 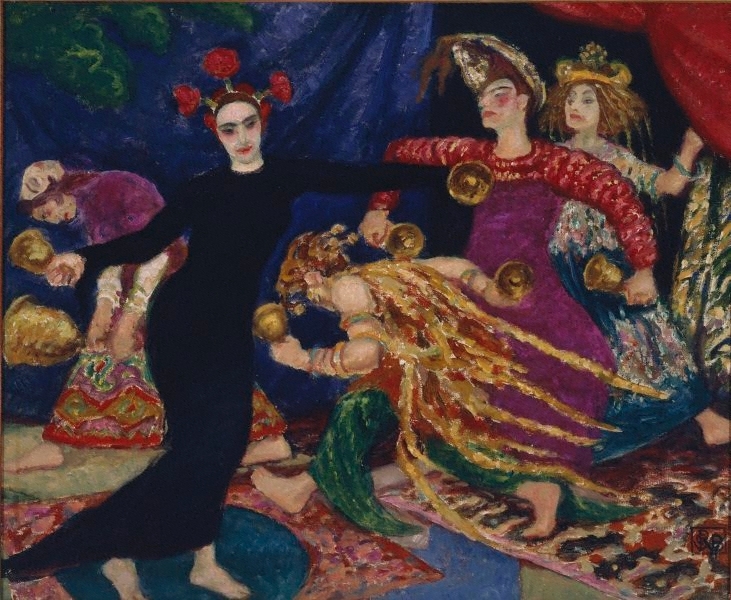 The painting visually encapsulates the vibrancy of modern dance and the exotic splendour of France’s belle époque, as well as the brilliant and unconventional colour combinations used in the costumes and sets of the Ballets Russes. Applying pure colour, Bunny created vibrant patterns using dynamic arabesque lines, interwoven to create vivid tapestry-like surfaces. Signed l.r. corner, black oil "RCWB" in monogram. Not dated. Jane Clark, Parallel visions: works from the Australian collection , 'Rupert Bunny / E. Phillips Fox', pg. 20-31, Sydney, 2002, 7 (colour illus,. detail), 24 (colour illus. ), 25, 28, 142, 147. David Thomas, Art and Australia [vol. 9, no. 4] , 'Rupert Bunny', pg. 328-337, Sydney, Mar 1972, 328 (illus. ), 331. David Thomas, Art Gallery of New South Wales Quarterly , 'Rupert Bunny', pg. 550-575, Sydney, Oct 1970, 555, 565 (illus. ).